My mother came down to Richmond for our Easter Block Party Parade and along with Greek Easter cookies, the mother lode of chocolate and stuffed bunnies, brought me a host’s gift, a half rack of lamb! A half rack of lamb is exactly the sort of thing that I love to see cross the threshold unbidden. 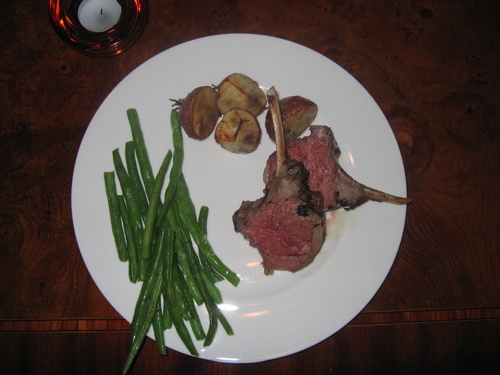 Cooking lamb is very easy and the rack makes an elegant presentation. Our half rack had six ribs, which was just right for three people (or two and a delicious lunch for one the next day.) I happened to have some leftover dijon vinaigrette in the icebox and we have a rosemary bush in the backyard. A little lemon (leftover garnishes from the Easter drinks tray) and some garlic rounded things out nicely. Here’s the official version of the Easy and Elegant Life Half Rack of Lamb. 1/2 rack of lamb (six ribs or so), trimmed of any excessive fat. Combine the two. Or I suppose you could mash it all together at the get go. My vinaigrette was already made. The result will be a little pastelike. Rub this into the lamb. Refrigerate for at least an hour. Two is better. More is best. Preheat the oven to 450ºF. When it is ready, cut the potatoes into similar sized wedges, toss with a little salt and a little olive oil. Add the lamb and the potatoes to a shallow roasting pan. (Throw in some carrots if you’ve got them.) Wrap the tops of the bones of the lamb rack with tin foil to prevent them from burning. Put the rack in the oven, turn down the temperature to 350ºF and cook for a half hour. For well done meat, cook for another twenty minutes. Ovens vary, so check with your thermometer to make sure you aren’t charcoaling it. Remove from oven, preheat broiler, put the rack under the broiler for about three minutes. It gives the outside a great colour. Let the meat rest for five minutes before you cut it. Which gives you enough time to wash, salt and butter some green beans to serve alongside. They take about a minute on full power in the microwave to steam. I serve it with a Côte du Rhône or red Bordeaux. Happy weekend and Happy Easter for the Orthodox amongst you. This entry was posted in Entertaining and tagged rack of lamb, spring recipes. Bookmark the permalink. I adore lamb! When I lived in the UK, people always served it. Over here, not so much. I grew up on ham for Easter–ew. One of the great things about adulthood is starting one’s own traditions, and lamb on Easter (and often for Christmas too) is definitely ours!. Mmmm. My Greek girlfriend in San Diego who owns Athen’s Market restaurant does a splendid rack of lamb! i do love rack of lamb. i had it as ‘the entree’ at one of my weddings. Now that is a mother who knows her son! I must send to you a recipe for leg of lamb, “Gigot de sept heures” which I prepared and it was sublime, we could have eaten it with a spoon. I do adore a rack of lamb, as well as ric-rac, one of my most favorite childhood trims. Hello Mrs. PvE, please do! Seven hours isn’t too bad to wait for perfection. The leftovers were made into souvelaki yesterday… . I remember rick-rac!